Is your web site a silent killer? Does it bang innocent visitors over the head with a hard sell, tie them up with awkward navigation, and then bore the life right out of them? You're not alone. 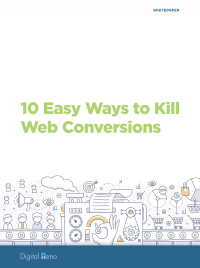 Web sites everywhere are killing promising conversions right this minute! The best web experiences are built when companies consistently strive to find and fix issues in the buying process. It is a tall order for busy marketing executives, but you must if you want your web site to fulfil its promise of introducing you to new customers and advocates for your products and services. This Digital Reno white paper sets out the Top 10 most common ways a web site fails the organization that owns it. Don’t let your web site get away with murder! Find out what it’s doing and how to fix it. Before it’s too late.